Facebook might seem old and tired now. But it still tops the charts at nearly 2.2 billion people who are active at least on a monthly basis. Of those, over 63% (or 1.4 billion) log into Facebook on a daily basis. Going by the most recent tally, global penetration for the social network is an astounding 22.9%. This means that more than one in every five humans is on Facebook. It’s enough to make any marketer’s mouth water. With so many people using Facebook, it would be natural to assume that posting more content to the social site would give your content more opportunities for users to see it. But that’s not exactly how it works. In fact, it’s actually the opposite. Wait. Why would fewer posts mean more reach? Does that even make sense? Actually, it does. Here’s why. Your organic reach is the number of people who see your “free” posts. And while there are strategies to boost your organic reach, it’s only getting harder and harder. In fact, the vast majority of Pages have seen a continual decline in their organic reach over the past several years. Some suggest that the changes to organic reach reflect a shift in the company’s priorities as Facebook focuses on maximizing profits from its hugely popular advertising system. 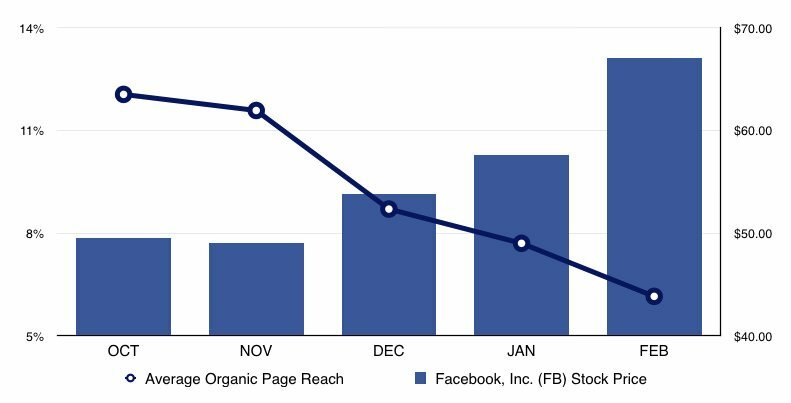 The chart above shows how Facebook’s stock has increased while average organic Page reach has decreased, implying some sort of correlation. Changes that Facebook has made to the News Feed algorithm mean that Facebook Pages can count on much less organic reach than before. One of the specific changes to the algorithm pertains to how Facebook counts post views. Previously, Facebook would count a post as a view if it merely appeared on a user’s News Feed even if that post never appeared on the user’s screen. With the algorithm changes, a post must actually make it onto a user’s screen before Facebook will count it as a view. It’s always been this way for paid (or “boosted”) posts, but it now counts organic reach in the same way. This change would be significant enough to reduce organic reach. According to a post from Mark Zuckerberg, they made these changes to the News Feed algorithm as part of a new direction for the platform. They want to help Facebook users have more “meaningful interactions” on the platform by making sure they’re seeing content from family, friends, and relevant branded content. Due to the overflow of marketing content on Facebook, the algorithm underlying the News Feed now prioritizes paid content over organic content. This limits a Page’s ‘organic’ content from dominating the News Feed and allows users to see more posts from their friends and family. Of course, their alternative is for you to pay to promote your posts. And Facebook has developed ways of weeding out all the noise so that only the trustworthy, informative, and relevant content remains. With the News Feed algorithm having undergone some pretty extensive changes and an overall refocusing, it’s a sink-or-swim situation. You have to learn how to compensate for the new status quo. Otherwise, you’ll sink into News Feed obscurity. But what if you want to actually grow your reach and gain more traffic? Is that still possible in lieu of the News Feed prioritizing in-network content? And you can do it while posting less content on Facebook than ever before. Plus, by posting less content, you’ll save time. Here are five tips to help you do this. The “signals” are the only component of the algorithm that you can control. You can see some of the signals the News Feed algorithm essentially scores as it determines whether a post should appear in a user’s feed. How, exactly, do you influence those signals? If you want to improve your Facebook traffic, the first step is to familiarize yourself with these. Then, focus on the ones that give you the best bang for your buck. For starters, you can create videos. Internet users have uploaded more video content online in just the past month than network television generated in 30 years. In fact, online video now accounts for about two-thirds of all online traffic — a figure that could climb to 79% within the next two years. According to current predictions, live video will account for 13% of all online video by 2021, which, in turn, could be over 80% of global web traffic and 85% of web traffic in the U.S.
To really put it into perspective, a single minute of video content is worth 1.8 million words. And marketers have figured this out. 81% of businesses are already using video as part of their marketing and traffic growth strategies. That’s a pretty substantial increase, as just 63% of businesses were using video in 2017. Of those businesses that aren’t yet making video content, 65% of them have plans to start by the end of the year. But does the demand for video really warrant such a heavy investment? Facebook wouldn’t be getting into original scripted content — much like rival platform YouTube has already been doing — if the company wasn’t confident in video. 500 million Facebook users — which, as you’ll remember, is roughly 25% of all Facebook users who are active at least monthly — watch some amount of video on Facebook every day. And when viewers watch good videos, they love to share them. Perhaps most importantly, Facebook’s algorithms seem to prioritize video over non-video content. A study from Locowise discovered this when they looked at 500 different Pages. They found that when a Page posts a video, an average of 16.7% of their fans will see it. Considering that the average for all types of content is only 11.4% of a Page’s fans, video clearly performs better. Buzzsumo broke down the Locowise data further, noting that photos reach an average of 11.63% of the audience while links and text reach 7.81% and 4.56% of the total possible audience, respectively. So, when a Page posts a video to Facebook, it gets substantially more reach than links, photos, and text content. This goes to show that video is crucial when it comes to marketing in the Digital Age, and it will likely remain so for the foreseeable future. For someone who wants to increase their traffic and overall presence on Facebook, video could be the secret to their success. Video will give you the most bang for your buck, too. You might also consider becoming familiar with Facebook’s best practices for live video. Unfortunately, your opinion of high-quality content doesn’t always matter. Instead, it’s all in the eyes of your customers. What content do they like to see? What kind of content do they find most valuable? What content do they find emotionally or intellectually engaging? Take my audience as an example. My audience consists of people who are looking for marketing and growth-hacking tips, so my content focuses on topics within that niche. When I post a link to Facebook, I include a concise, accurate description that features particular buzzwords from the article so that my audience can quickly tell what the article is about. The article itself follows all the content marketing best practices. The paragraphs aren’t too long, I don’t use overly-complex language, and I break them up with plenty of visual elements. It’s not even about the web design. The page is actually relatively simple, which lets readers quickly zero in on the real value: the content. Most importantly, if you look back to my Facebook post, you’ll realize that it accurately conveyed what was in the article while still making the link enticing. The trick is to use these click clues from your audience. The relationship between you and your audience is a two-way street. They give you feedback in the form of views, clicks, likes, and more. That should give you an indication of what to do more or less of to meet their needs. Ultimately, that’s what ‘relevance’ means. The good news is that it’s really not hard to create great content as long as you put the time and effort into your content development, creation, and marketing processes. The bad news is that it takes a lot of time and money to do all of this. But there’s potential for some pretty incredible payoff in the end. According to recent estimates, content marketing will be a $300 billion industry by the end of 2019. This is because companies are recognizing that the Internet is full of content, and the ones who have the best content are usually the ones that win. So, pull other tactics into the equation to help supplement your workload. According to the CoSchedule Rule of Thirds, you can curate as much as one-third of your total content. When you curate your content properly, it can have great reach and audience engagement. There are two critical Facebook traffic-generation concepts to master: reach and engagement. Basically, “reach” refers to how many people see your post. “Engagement” refers to interactions with your post, such as likes, comments, shares, and so on. Obviously, both are important for different reasons. You can’t get meaningful engagement without a big enough reach. But you also can’t increase reach today without engagement. And that’s a big problem because most Pages have way less organic reach with these new algorithm updates. That’s why you need new ways to cultivate engagement every chance you get. And one of the best ways to get your audience to engage is to have “meaningful interactions” with them. When someone comments on something you’ve posted, respond to that person’s comment. Actual interaction is great for increasing your Facebook traffic. When you acknowledge a person, you give them a feeling of validation that causes him or her to be more likely to engage with your future content. You’re building relationships with members of your audience. In turn, they become more likely to share your content with the hundreds or thousands of people in their networks. For instance, I try to reply to every single comment I get on Facebook. Sometimes, I’ll even dialogue back and forth with users. Each comment only takes a few seconds to write. But it shows people that I really care about what they’re saying. The other benefit of this strategy is that it gets my audience to interact with their own comments. I’ll jump in to help, and then other readers will also add to the conversation. Social media experts like to throw around the words “engagement” and “community,” but they rarely explain what those words mean. The best sign that you’re onto something is when your fans start to interact with each other. And the only way that starts is by you taking the lead. You have to do this day after day, week after week, month after month. Fewer businesses are able to rely on organic reach alone with these algorithm changes. But, at the same time, being smart with your Facebook advertising budget is more important than ever. So, how do you know which posts you should pay to boost and which posts you shouldn’t? Everything you need is right there in your analytic data under Facebook Insights. When you use them strategically, boosted posts can have an immense effect on your traffic by increasing your reach and engagement. It starts with creating a budget for Facebook Ads. Now, this is a complex topic by itself. Fortunately, I’ve already written all about how to create and spend your marketing budget. So start there, and then come back when you’re ready. Once you set a budget, you have to decide how much of that budget you want to spend promoting the right posts. Don’t just pay to promote every new post. Why? You don’t know for sure whether those will resonate with your audience or not. Instead, use the best posts from the past. Rely on your Insights data to figure out which posts are already your top performers. Then, put your budget behind those to reach new audiences. Facebook also introduced a new feature that lets you spy on the competition’s best-performing posts. This strategy is perfect if your own Page is relatively small. In that case, you might not have enough data to draw any real insights. Instead, use data from other popular brands that your own customers might follow. Let’s say that you have a new SaaS app for marketers, but you don’t have any followers just yet. That’s no problem. Crazy Egg already has over 10,000 fans. Kissmetrics has another 40,000. From these pages, you can get real, actionable ideas that others have already had success with. And you can find this data in about ten seconds. If you have enough of your own analytics data, then you can use it to predict how your posts will perform if you deliver them to a larger audience. If your audience liked a post and engaged well with it apart from you boosing it, then you can expect to see an increase in engagement if you boost it. When you adopt this practice of promoting only the posts that have proven to have high pre-boost engagement, you’ll find far greater success than if you haphazardly boost new posts that you haven’t had a chance to test. As I bring this post to a close, I want to point out some of the things you shouldn’t do if you want to increase your Facebook reach, engagement, and traffic. Don’t post more than two or three times per day. If you post more than that, your content will be competing with itself. Plus, it’s virtually impossible to enforce quality standards when you have excessive output. Don’t exclusively post links to your own products and services. Today’s consumers are savvier and can smell inauthenticity from a mile away. If you’re only posting your own products and services, it says that you’re more concerned with self-promotion than you are with your actual audience. You can use hashtags occasionally to punctuate a piece of content or to make it easily searchable. But audiences are actually put off by hashtags when you string lots of them together in a single post. Don’t forget who your audience is. Use the demographic data available to you and tailor your content to your actual audience. By simply avoiding these practices, you’ll start attracting traffic to your Page in no time. The best part is that these tips really aren’t that hard to implement. You just need to think about what you’re posting, why you’re posting it, how you’re posting it, and who you’re posting it for. If you’re trying to get more traffic to your Facebook Page, it’s natural to think that more content is better. With Facebook’s new algorithm, organic traffic is difficult to come by. If you want to maximize your efforts, you need to focus on quality over quantity. Start by learning more about Facebook’s algorithm so you can post content that will perform well on it. If you don’t, you’re flying blind. Video content is huge on Facebook. If you’re posting less, you’ll find the best return on your investment by creating high-quality videos. In every post, offer your viewers real value. There is endless content on the Internet, so you need to post high-quality content to stand out and gain a loyal following. And as your fans engage with your content, interact with them to build relationships and stimulate more engagement. It’s a two-way street, and it takes time. But the following you’ll gain is worth the effort. Finally, don’t be afraid to boost some of your posts. But be strategic about which posts you boost. Invest in the ones that you’ve already seen users engage with to ensure that you don’t waste your marketing budget on a post that won’t perform well. Overall, it’s not difficult to grow your audience on Facebook. You just need to use the right strategies. If you’re using the tips and tricks I’ve provided here, you’re well on your way to bringing in precious traffic while posting less. How are you planning to increase your Facebook traffic by posting less? The post How to Get More Facebook Traffic by Posting Less appeared first on Neil Patel.